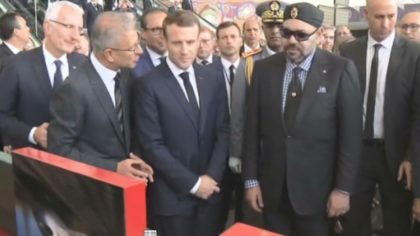 Morocco’s high-speed line, the first of its kind in Africa, that has been inaugurated Thursday by King Mohammed VI and French President Emmanuel Macron, is a milestone rail achievement in the region. Also, it reflects the long-standing Moroccan-French friendship and stands out as an example of a “win-win” North-South partnership. Dubbed “Al Boraq”, this brand-new TGV, which cost the North African kingdom over $2 billion, will deliver high-speed journeys from the Northern city of Tangier, Morocco’s gateway, to the cities of Kénitra, Rabat, and Casablanca. The high-speed trains will travel up to 320km/h reducing the journey duration from Tangier to Casablanca, Morocco’s economic capital, to 2h 10min, instead of 4h 45min. After three years of service, these trains are expected to transport up to six million passengers. The project, launched in 2007 after the deal was sealed during a visit to Morocco by former French President Nicolas Sarkozy, was completed after eleven years of Moroccan-French cooperation, an appropriate transfer of know-how, and the upgrading of engineering and advanced technical skills training. In this connection, and in order to ensure the maintenance of the high-speed trains, Morocco opened a national academy for railway engineering in Rabat in 2016 in coordination with the French railway operator, SNCF, to provide technical training to the staff of Morocco’s state-owned railway operator ONCF. L’Institut de Formation Ferroviaire (IFF) also provides training to railway engineers and workers from France as well as from other countries in the region. Part of the project, the North African kingdom had bought 14 high-speed trains from France’ s train manufacturer, Alstom. Morocco’s state-owned railway operator ONCF and French national operator SNCF created a joint venture, La Société Marocaine de Maintenance des Rames à Grande Vitesse. The joint venture will maintain ONCF’s fleet of Alstom Duplex high speed trains for a 15-year period under a contract worth €175 Million. A 15-year package of after-sale support worth €90 million had also been signed by the two parties. During the construction works, a new generation of engineers were trained and thousands of jobs were created. According to official figures, during the implementation phase, the project helped create 30 million days of direct and indirect employment, while in the exploitation phase, the Moroccan TGV is expected to generate 1,500 direct and 800 indirect jobs. This high-speed rail line provides the greenest, safest and most efficient forms of transport. The investment injected will help give a new momentum to business and the economy as it has already contributed to the creation of jobs and stimulated economic activity in the country, helping unlock its huge untapped potentials. Besides, the experience acquired by Morocco in this area could be shared, particularly with African countries, in the framework of the South-South cooperation strategy, spearheaded by King Mohammed VI.